Published on November 13, 2017 in Events. 0 Comments Tags: event, extended play, Perth Games Festival, pgf2017, unconference, volunteers. 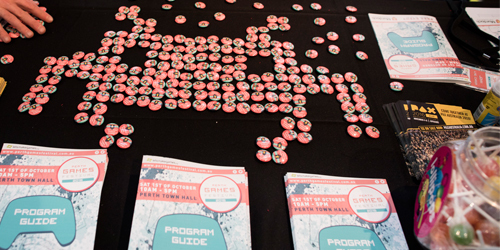 On November 25th, the Perth Town Hall will once again be filled to the brim with Western Australia games that you can play for free, as the Perth Games Festival returns for 2017! Here’s what you need to know to have a day of awesome free fun. When: 25 November, 10am – 5pm. Tickets: Free!! Invite your friends via the Facebook Event Page. ♿ Accessibility: The Perth Town Hall is wheelchair/ mobility scooter accessible, and will include Auslan interpreters at all Panels. For more information, including Visual, Hearing, Mobility features and Additional Support, visit the PGF Accessibility page. To celebrate the end the Perth Games Festival Weekend for 2017, we’ll be hosting our third ever Extended Play Unconference on Sunday, 26 November. This casual afternoon is set to feature informal talks and discussion on game development. It’s a free event, and all are welcome – but please note that spaces are limited so book your ticket to Extended Play via Eventbrite. This event simply could not happen without community support; so why not be a Perth Games Festival volunteer this year? Whether you enjoy making or playing games, are an aspiring developer or seasoned veteran, have gotten involved before or are new to all this; now is a great time to get involved and help us show off the great games (and games community) we have in Western Australia. ➠ Find out more about being a Festival Volunteer here! For more information on this upcoming event of local gaming excellence, check out the official Perth Games Festival website. You can also keep an eye on the Perth Games Festival main Facebook page, 2017 event page, or Twitter. The Let's Make Games archives for the pgf2017 tag.